Dynapole A manufacturer of steel and aluminum poles with in-house powder coating facilities and the ability to satisfy your special requirements with custom designed poles. Keene by Signify Trusted by specifiers and contractors since 1965, Keene’s expanded product line now includes interior and exterior architectural lighting solutions guaranteed to perform for Canadians, day and night, year in, year out. Lumec is Signify Lumec holds a leading position in the Canadian decorative and functional outdoor lighting market, offering both contemporary and traditional luminaries with modern high-performance optical technology. Taylor - Magniflood For more than 50 years, Magniflood has designed and manufacturered quality lighting products. The path to success is not easy, but it is simple. Make a quality product at a fair price, be honest to your customers and deliver on time. 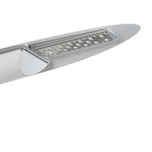 Taylor - Razr Lites RazrLites, a Celeritas Lighting Group Brand, is a premier distributor of LED lighting products. Razr fixtures are designed for maximum energy savings, reduced maintenance, increased service life, and improved light quality. Valmont Valmont's broad array of steel, aluminum and composite poles, specialty structures and towers are standing tall . . . bringing light and order to new and existing markets.